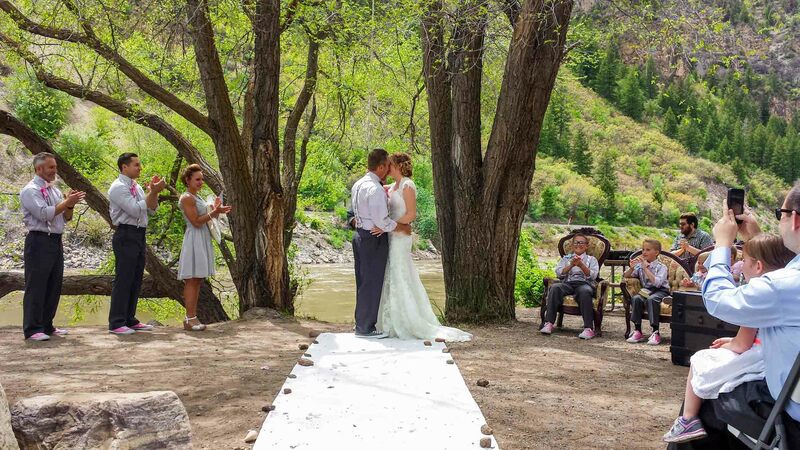 We invite you to visit Glenwood Canyon Resort for a full tour of our fabulous event center venues and facilities in this truly magnificent setting! You really have to see it to take in the sheer beauty and panoramic views. 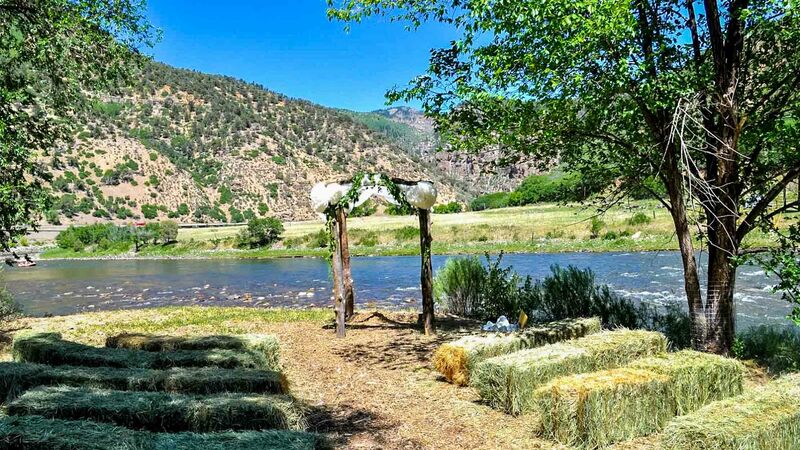 This location has plenty of space to arrange your chairs (or hay bales) for all of your guests. Set up your altar close (or not) to the river’s edge and exchange vows with the tranquil sounds of the river meandering by. There is also plenty of room to set up tables and buckets with items to greet your guests, perhaps with a pre-celebration cold drink. The area offers up pretty river views and is covered with wood chips for walkways. This is our most popular outdoor venue by far! Set in the area of several campsites, it is surrounded by large trees with stunning views of the canyon and river. 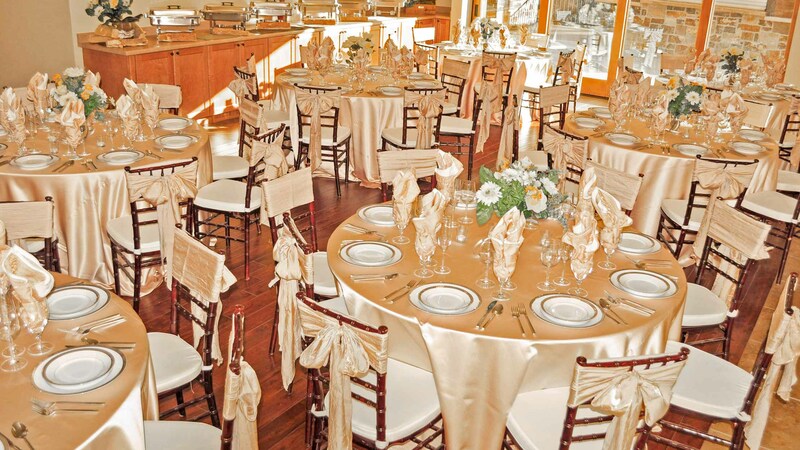 There is plenty of room for tables to hand out wedding announcements and chairs to accommodate all of your guests comfortably. This is also a popular spot for family and wedding party photos. This venue is located at the Canyon Club Event Center and offers up 5,000 sq. ft. of space. A huge advantage of this venue is that the No Name Bar (a covered cabana type bar) is located in a corner of the terrace making it easy for guests to quench their thirst before the ceremony begins. The terrace can be covered with a tent if needed or desired. This elegant room is 2,000 sq. ft. and can comfortably accommodate 80 seated guests. It has gorgeous wooden floors and neutral decor which makes it easy to decorate to your specific needs. The Grand Room has 3 sets of large sliding doors that fully open up to the Outdoor Terrace, if and when desired. Obviously, this is the best choice if you have any concerns about the weather. 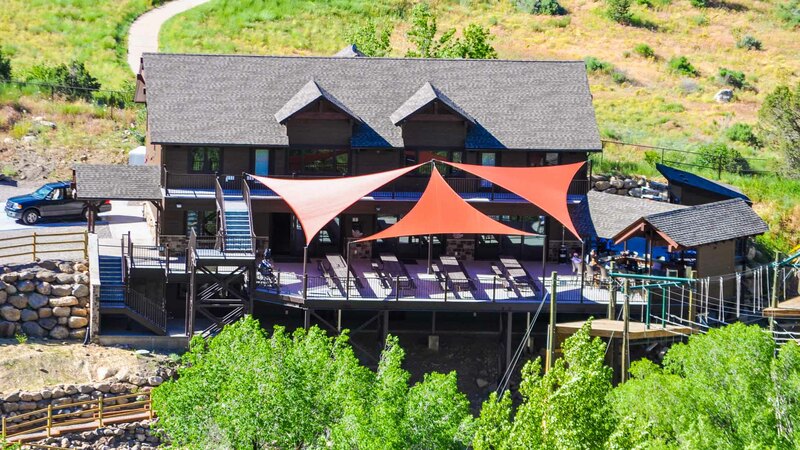 The award winning Canyon Club Event Center @ Glenwood Canyon Resort features both indoor and outdoor venues to accommodate your guests in style. You may choose one or both based on the number of guests and your needs for space. This elegant room is 2,000 sq. ft. and can comfortably accommodate 80 seated guests. It has gorgeous wooden floors and neutral decor which makes it easy to decorate to your specific needs. The Grand Room has 3 sets of large sliding doors that fully open up to the Outdoor Terrace, if and when desired. A dance floor can be easily installed in this room. Your entertainment can also set up in this room when combined with the Outdoor Terrace. An indoor bar can be set up in this room if needed. The spacious 5,000 sq. ft. terrace can comfortably accommodate 100+ seated guests. Out on the terrace you’ll most surely enjoy spending time at our covered bar, the No Name Bar, overlooking the river and canyon. Your entertainment can easily be set up in this area and the concrete flooring of this terrace can be used as the dance floor.